BusyCal 1.6 is not compatible with OS X 10.9 or later. You can upgrade to BusyCal 3, if you are running OS X 10.11 or later. Please read the following for more info. Sync Services, an underlying framework on OS X used for syncing local calendars in BusyCal with OS X Calendar, no longer exists in OS X 10.9 and later. The telltale sign of problems with Sync Services is a BusyCal error message stating that syncing has been disabled. Clicking the Yes button to enable syncing will have no effect and the dialog will repeatedly appear. You can stop BusyCal from syncing with Sync Services by choosing BusyCal > Preferences > Advanced, and unchecking "Sync with Sync Services". That will put an end to the pesky error message but BusyCal will still be unable to sync local calendars with OS X Calendar. However, if you're syncing exclusively with iCloud then syncing local calendars with OS X Calendar may not be necessary. Prior to OS X 10.9, you could sync calendars in BusyCal with an iOS device via iTunes and a USB cable. 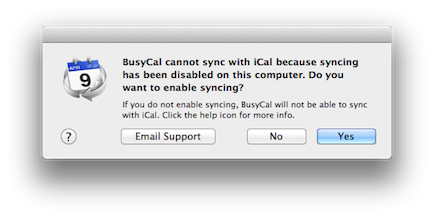 That capability was removed in OS X 10.9 and later and it is no longer possible to sync BusyCal with an iOS device via iTunes. Instead, the recommended way to sync BusyCal with an iOS device on OS X 10.9 and later is through a cloud-based service like iCloud, Google or Exchange. Syncing local calendars — You cannot sync local calendars between BusyCal and OS X Calendar. To sync calendars between BusyCal and OS X Calendar, the calendars must be hosted on a cloud-based service like iCloud. Syncing with an iPhone via iTunes — You cannot sync BusyCal with an iPhone via iTunes. You can only sync with an iPhone through a cloud-based service like iCloud. BusyCal 1.6 may work on OS X 10.9 or later if you are syncing exclusively with iCloud, but we do not support running BusyCal 1.6 on OS X 10.9 or later. Mac OS X, iCloud and Google are constantly changing. Apps that sync with them must be continually updated to maintain compatibility. BusyCal 1.6 is no longer being updated and we do not support running it on OS X 10.9 or later. We recommend upgrading to BusyCal 3, if you are running El Capitan, which is under active development. If you are running BusyCal 1.6 and upgrade to OS X 10.9 or later, you may end up with orphaned calendars in OS X Calendar that are no longer syncing with BusyCal that you will need to delete in OS X Calendar. LAN calendar subscriptions — LAN calendars that you you are subscribed to in BusyCal will be orphaned in OS X Calendar, where they will appear as local calendars under ON MY MAC. You will need to delete the orphaned calendars by control-clicking on them in OS X Calendar's left sidebar under ON MY MAC and choosing Delete. If you are running El Capitan, we highly recommend upgrading to BusyCal 3.